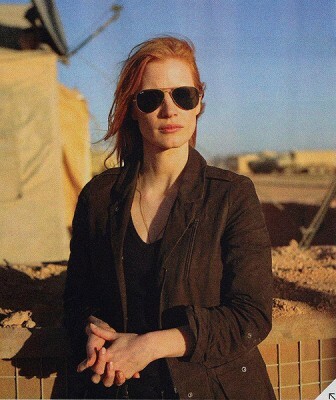 Zero Dark Thirty is yet another great picture to come out of the Annapurna Pictures production house. This year, the studio put out Lawless, The Master, and Killing Them Softly, all movies which have brass balls, but many of which had mixed feelings overall. Well, there are no mixed feelings about Zero Dark Thirty, as this movie has been getting almost universal acclaim…until the curious, wrong Oscar nominations came out and somehow, Kathryn Bigelow was skipped (as was Ben Affleck). I blame the very good but overrated Beasts of the Southern Wild for that. Overcompensation can be a killer. Zero Dark Thirty is about the hunting of Osama Bin Laden, and it once was going to be a picture about how we couldn’t capture or kill the guy. But then, in 2011 (spoiler alert! ), we killed the guy. The movie then had to be changed to reflect that. At the center of this movie is CIA agent Maya (Jessica Chastain, who is awesome), based on a real person. She believes, despite all the noise around her, that a recurring name of a courier that keeps popping up when interrogating captured terrorists could lead them to Bin Laden. Because the hunt is so massive, because the information is so confusing, because people could be lying, covering up, “misremembering,” and so forth, her belief is not given great weight. The movie basically begins by showing brutal torture techniques, which has been the center of the film’s controversy. And while the filmmakers have taken great pains to illustrate that the terrorists only really start talking when they are treated nicely, it’s sort of a Catch-22 situation, isn’t it? I don’t know if you get the same information if you just start treating people nicely right off the bat, or if being nice after all the brutal torture is what works. I have no idea. But the movie’s logical flow illustrates that severe beatings were in order, then showing niceness afterwards is what worked, and the threat of more torture might have kept some people in line. Anyway, a name keeps popping up, a man by the name of Abu Ahmed, and Maya becomes obsessed with trying to figure out how to keep track of him. In the middle of this obsessive search, Maya comes into contact with a number of people all looking for Bin Laden in their own way. The chief torture guy is Dan (Jason Clarke, who we’ll be seeing a lot of in the future), a man whose exhaustive battle with detained terrorists is wearing him down. There’s Jessica (Jennifer Ehle), a woman who at first looks like Maya’s chief rival but then they become fast friends. The great Kyle Chandler plays Joseph Bradley, a CIA chief who has to weigh all the evidence and is paid to be skeptical when someone comes to him with a lead that could be false or a dead end. By the time Maya finally gets people to listen to her, she runs into the famed Seal Team Six (with recognizable faces Joel Edgerton and Chris Pratt making appearances). This movie is really intense. There are a number of great scenes leading up to what is the best sequence in a film of 2012: the Seal Team Six helicopter ride into Pakistan and the assault on the now infamous compound where Bin Laden hid out. But before it even gets to that incredible sequence, the mystery, the detective work, the trials and tribulations of being right and no one wants to listen, and the absolute danger these CIA people were in when traveling around hostile areas, is a thrilling movie in of itself. There are times when something absolutely jarringly unexpected happens, and Bigelow rarely telegraphs these “something bad is going to happen” scenes. It’s one of those things I’ve always hated in movies, and although Bigelow does do it once, for the most part it avoids telegraphing bad stuff, which makes the bad stuff all the more a surprise. Jessica Chastain plays a woman we don’t get to see in movies too often. Though her job requires her to be hard-nosed and tough, many actresses might play this as if they were a man, by making their hair real short and deciding to play it butch. But somehow she plays this character without a hint of that “I’ve got to show these boys I can play hardball” type of gumption that always seems so phony in movies. The feminism is more of a subtext in this film, which makes it all the more powerful. Still, I’m scratching my head how Bigelow didn’t get nominated for this. She won for The Hurt Locker (also written by Mark Boal) back in 2008, and became the first woman to win Best Director. 4 years later, a shoe-in, slam-dunk movie comes along that is universally praised, and she gets shut out. And this movie required way more skill than some of the ones that got nominated. Anyway, if you weren’t already wanting to see this, you should. It’s pretty damn great. Annapurna is run by the very fetching Megan Ellison as well which is also a plus. Really curious to see what they are going to do with the Terminator franchise; can’t be worse than Termainator: Salvation so she has that going for her.